Red Smith is the most respected sports columnist we've ever had. In his prime, Jimmy Cannon, Smith's friendly rival, was certainly as well-known. Cannon, the Voice of New York, was an emotional, colloquial writer whose reputation, unfortunately, has faded. But Smith endures. What is it about his writing that ages so well? "It's the same reason Shakespeare ages well," Dave Anderson, the Pulitzer Prize-winning columnist told me recently. "He wrote beautifully, it's as simple as that." The Library of America presents Smith's finest work in the new collection, American Pastimes: The Very Best of Red Smith. It is available now and a must-read for all sports fans, young and old (and an ideal gift for Father's Day). This week, with permission from Smith's family, we'll reprint a Red Smith column every day to offer you a sample of what he was all about. Today's column is "Miracle Of Coogan's Bluff," which ran on October 4, 1951, the day after Bobby Thomson sent the New York Giants to the World Series with his historic Shot Heard 'Round the World. So, enjoy, and for more on Smith, check out this oral history from Jerome Holtzman's classic, No Cheering in the Press Box; this excerpt from Stanley Woodward's memoir, Paper Tiger; a nice tribute by his son, Terrance Smith; and this excerpt from Dan Okrent's introduction to American Pastimes. 'Course it goes without saying that if you want to know from Red Smith you need to go find a copy of Ira Berkow's excellent biography, Red. Now it is done. Now the story ends. And there is no way to tell it. The art of fiction is dead. Reality has strangled invention. Only the utterly impossible, the inexpressibly fantastic, can ever be plausible again. Down on the green and white and earth-brown geometry of the playing field, a drunk tries to break through the ranks of ushers marshaled along the foul lines to keep profane feet off the diamond. The ushers thrust him back and he lunges at them, struggling in the clutch of two or three men. He breaks free, and four or five tackle him. He shakes them off, bursts through the line, runs head-on into a special park cop, who brings him down with a flying tackle. Here comes a whole platoon of ushers. They lift the man and haul him, twisting and kicking, back across the first-base line. Again he shakes loose and crashes the line. He is through. He is away, weaving out toward center field, where cheering thousands are jammed beneath the windows of the Giants’ clubhouse. At heart, our man is a Giant, too. He never gave up. From center field comes burst upon burst of cheering. Pennants are waving, uplifted fists are brandished, hats are flying. Again and again the dark clubhouse windows blaze with the light of photographers’ flash bulbs. Here comes that same drunk out of the mob, back across the green turf to the infield. Coattails flying, he runs the bases, slides into third. Nobody bothers him now. 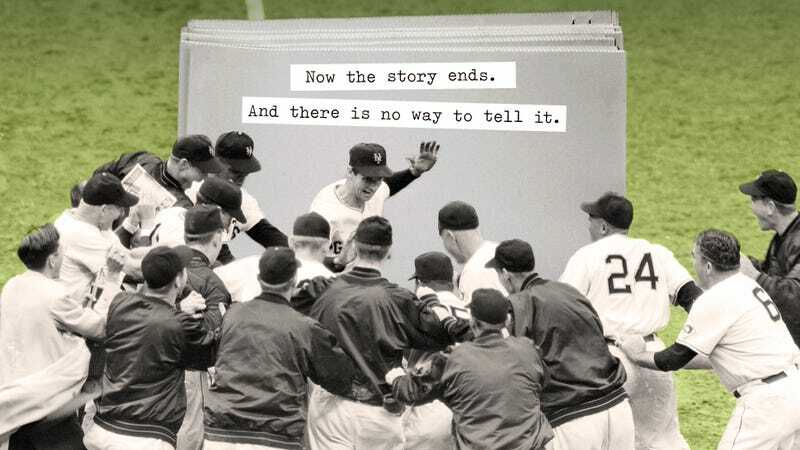 And the story remains to be told, the story of how the Giants won the 1951 pennant in the National League. The tale of their barreling run through August and September and into October. . . . Of the final day of the season, when they won the championship and started home with it from Boston, to hear on the train how the dead, defeated Dodgers had risen from the ashes in the Philadelphia twilight. . . . Of the three-game playoff in which they won, and lost, and were losing again with one out in the ninth inning yesterday when—Oh, why bother? “Well!” said Whitey Lockman, standing on second base in the second inning of yesterday’s playoff game between the Giants and Dodgers. And the Giants’ first chance for a big inning against Don Newcombe disappeared as they tagged Thomson out. Up in the press section, the voice of Willie Goodrich came over the amplifiers announcing a macabre statistic: “Thomson has now hit safely in fifteen consecutive games.” Just then the floodlights were turned on, enabling the Giants to see and count their runners on each base. It wasn’t funny, though, because it seemed for so long that the Giants weren’t going to get another chance like the one Thomson squandered by trying to take second base with a playmate already there. They couldn’t hit Newcombe, and the Dodgers couldn’t do anything wrong. Sal Maglie’s most splendrous pitching would avail nothing unless New York could match the run Brooklyn had scored in the first inning. The story was winding up, and it wasn’t the happy ending that such a tale demands. Poetic justice was a phrase without meaning. Now it was the seventh inning and Thomson was up, with runners on first and third base, none out. Pitching a shutout in Philadelphia last Saturday night, pitching again in Philadelphia on Sunday, holding the Giants scoreless this far, Newcombe had now gone twenty-one innings without allowing a run. He threw four strikes to Thomson. Two were fouled off out of play. Then he threw a fifth. Thomson’s fly scored Monte Irvin. The score was tied. It was a new ballgame. Wait a moment, though. Here’s Pee Wee Reese hitting safely in the eighth. Here’s Duke Snider singling Reese to third. Here’s Maglie wild-pitching a run home. Here’s Andy Pafko slashing a hit through Thomson for another score. Here’s Billy Cox batting still another home. Where does his hit go? Where else? Through Thomson at third. So it was the Dodgers’ ballgame, 4 to 1, and the Dodgers’ pennant. So all right. Better get started and beat the crowd home. That stuff in the ninth inning? That didn’t mean anything. A single by Al Dark. A single by Don Mueller. Irvin’s pop-up, Lockman’s one-run double. Now the corniest possible sort of Hollywood schmaltz—stretcher-bearers plodding away with an injured Mueller between them, symbolic of the Giants themselves. There went Newcombe and here came Ralph Branca. Who’s at bat? Thomson again? He beat Branca with a home run the other day. Would Charley Dressen order him walked, putting the winning run on base, to pitch to the dead-end kids at the bottom of the batting order? No, Branca’s first pitch was a called strike. The second pitch—well, when Thomson reached first base he turned and looked toward the left-field stands. Then he started jumping straight in the air, again and again. Then he trotted around the bases, taking his time. Ralph Branca turned and started for the clubhouse. The number on his uniform looked huge. Thirteen. Top image by Jim Cooke.